This is a game submitted for a contest held by UW GameDev Club, where the game has to be done entirely in 24 hours (honour system). Any choice of language or API was allowed, and all entries have to follow the theme: the theme this time was "color, or a lack thereof". I decided to make a small 2D arcade game. My entry was in C++ using GDI+ for graphics. There are 4 floors, each successive one is a little bit harder. 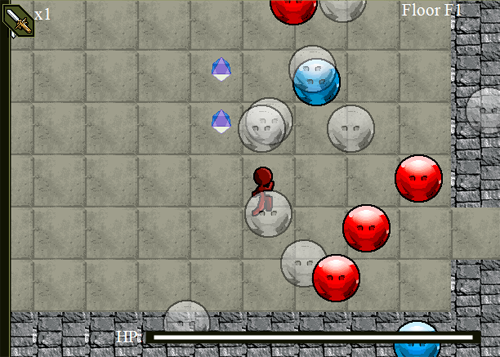 The enemies are more numerous, move more quickly and a higher proportion of them will 'home' toward the character. The maze as generated by recursively partitioning the map area into rectangular 'rooms'. 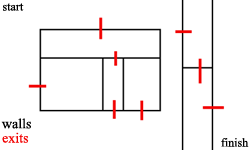 At each step the room will either be partitioned vertically, horizontally, or have another 'room' placed within it. 'Exits' (clearings in the wall) are added for reachability. Reachability is ensured for all areas in the map. 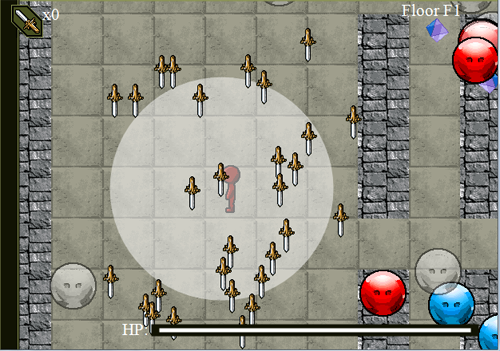 Swords are an area-of-effect item that can be found scattered around the map; they are more frequent when there are more enemies. To use one, press 'b'.